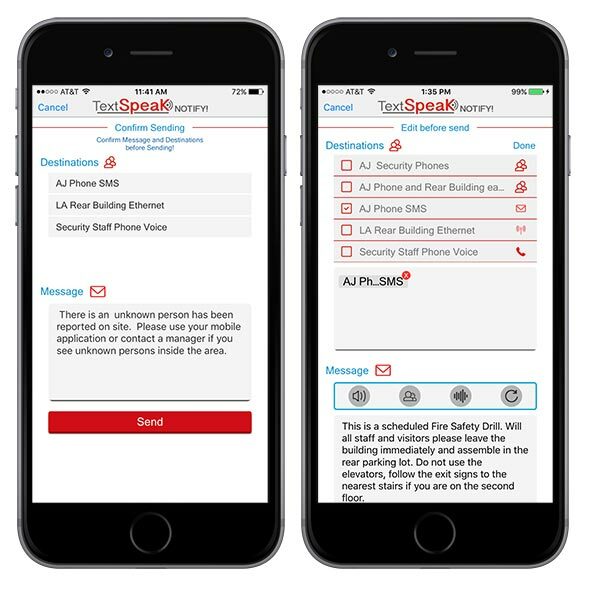 TextSpeak App is available for iPhone, iPad and Android phones and tablets as well as Mac OSX and Windows Browsers. 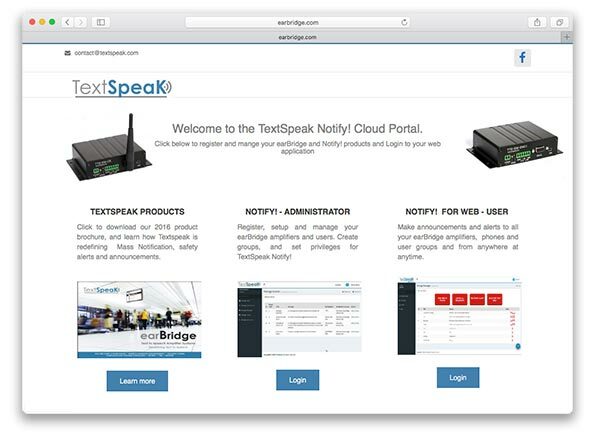 Access the apps and administration features through the TextSpeak NOTIFY! Web Application. 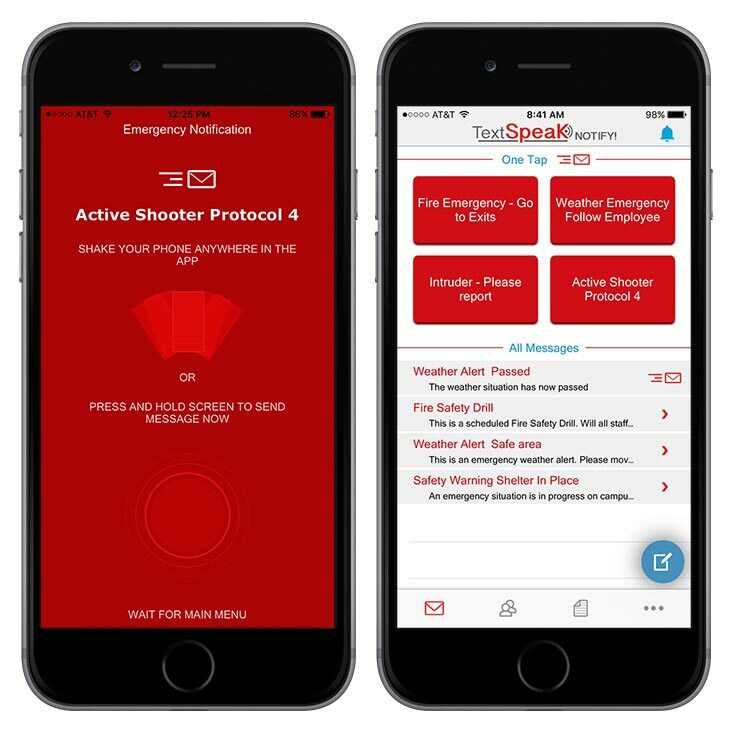 TextSpeak App launches with a special Emergency screen (smartphone version only) with a large One-Click emergency message for fast and easy access to the most critical message. After a few seconds the screen defaults to the main screen. The main message screen includes 4 pre-prgrammed red buttons for the most critical One-Click Messages. One-Click Messages include a text message and single or multiple destinations with a confirmation screen after the button is pressed. Below the 4 main buttons are additional One-Click Messages (shown with the envelope Icon), and Normal Messages (shown with ‘>’ icon) that include a text message but require the user to select a destination. Normal Messages are for less critical messages that you may want to send at different times to different destinations. Press on any of the One-Click messages or buttons to send – for example the red button ‘Intruder-please report’. The screen then comes up showing the pre-programmed destination(s) and the text message. Simply confirm and the message is sent (left image). 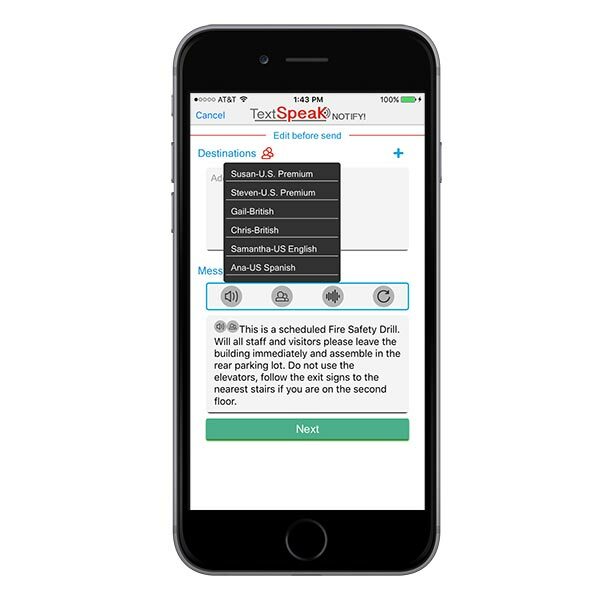 Press a Normal Message from the list on the main message screen to send, for example ‘Fire Safety Drill’. The confirmation screen (shown right) allows the user to select a single or multiple destinations for the message, then send the message to the selected destinations. Administrators can give Users access to edit and create new messages. If the Administrator has given the User access to Edit Messages and Destinations the user can create their own message and create a new Destination Group. The screen on the left shows the User creating a new message in the app including selecting a destination. The screen on the right shows the User can create a new Destination Group by naming a new Group and adding individual destinations. A Destination group is simply a collection of individual destinations, for example it could be the text phone numbers of all management staff in a facility. TextSpeak applications and the Device amplifiers can support 9 concurrent TTS languages and 25 voices. The amplifiers can be set to a default language and voice, allowing messages to be sent in Spanish, for example. And voices can be set to different accents such as an American or British English accent. TextSpeak does not translate between languages, especially in mass notification systems, this would cause too many unacceptable errors. 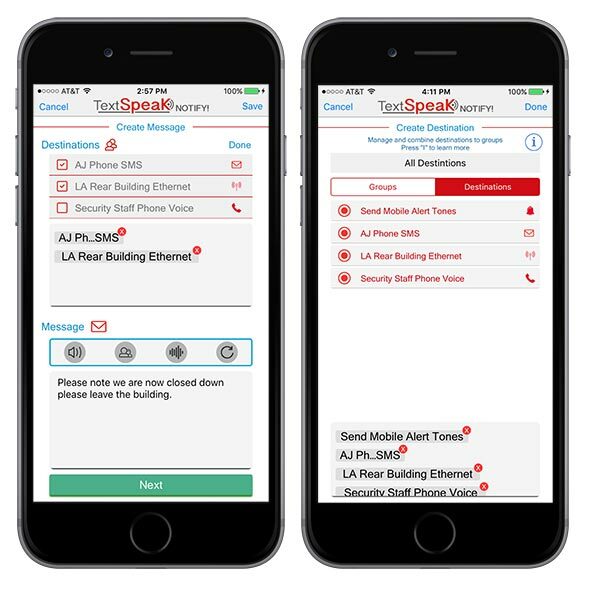 If the amplifier has been set to English, messages written in English in the TextSpeak App will be spoken in English with the accent selected by the Administrator. However, messages can be written in another language, with the option to switch, say from English to Spanish, just for that message or part of the message. In the example image, the User can insert a switch from one language to another into the message, and then add the text in that language. The language options shown are those installed in the TextSpeak Device amplifier. 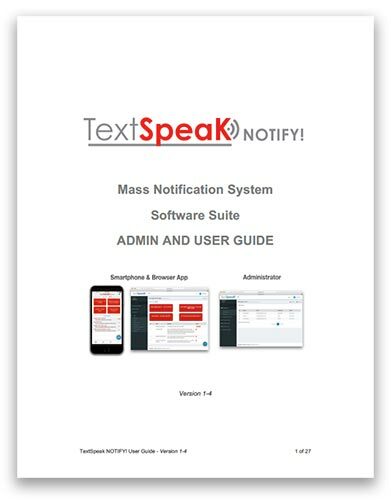 To find out more about TextSpeak App features and capabilities check out the Software Admin and User Guide that includes information about the User and Admin features in depth. Features are exactly the same in all versions of the app including iPhone, iPad, Android smartphone and tablet and web browser. Click here to go back to the main TextSpeak NOTIFY! page.